Manchester United vs Manchester City is ‘the biggest game in football’, according to the Citizens’ captain Vincent Kompany. Honestly, there is hardly any better way to put it. Despite City only becoming real trophy contenders a few years ago since the great Arabian takeover, this fixture has a large history spanning over a hundred years behind it. There is nothing quite like derby day, with both teams fighting for the bragging rights of the city. At this stage of the season as well, with United trailing City by 8 points at the top of the table and desperately needing a win against their noisy neighbours to catch up, the weight and the excitement of the fixture appears to have gotten heavier, and both sets of players will want to be at their best to stand a chance of winning. Kevin De Bruyne has been one of the best players in the Premier League so far this season, if not the best. Every single thing he touches seems to turn into gold at the moment, and the fact that he leads the way in terms of Premier League assists, with 8 in 15 games, is by no means a fluke. He makes City tick, always surging forward and supplying the front line alongside David Silva. Mourinho may well have made a huge mistake letting De Bruyne leave Chelsea, but he definitely won’t be underestimating his ability on Sunday. With Pogba not around, Nemanja Matic will have an added importance to his role, but there is also a certain someone in the United squad who is renowned for his man-marking ability. Ander Herrera expertly filled the role of a man-marker against Chelsea last season, giving Eden Hazard absolutely no room to take touches or move around with the ball. It completely took the Champions’ most influential player out of the game. If Herrera can perform a similar role on De Bruyne against the noisy neighbours, they may find it hard to feed their forward line and as a result, limit their chances of scoring. With Silva seemingly out of the game, getting rid of De Bruyne will be key. Pretty obvious, this one. It is simply not going to work. United have an attack that can be absolutely magnificent on its day, but there is little that can oppose the fact that City’s is slightly better. Now that Pogba is out, it makes it even worse for Mourinho, because he seems to have no option now but to go for the defend and counter attack method. The fact is, City do have a very wobbly defense, and John Stones’ injury has only served to weaken it further. Mangala is a mess, and captain Kompany is rarely ever match-fit due to his injuries. However, the issue is, if United attempt to go and attack, they must be very lethal with every attempt, or the Citizens will absolutely rip them to shreds on the counter. Forget City’s defense, United are struggling with a center-back crisis of their own at the moment. Phil Jones and Eric Bailly have both been ruled out of the game with pretty substantial injuries, while Marcos Rojo was left out of the squad to face CSKA Moscow as he was ‘tired’. That leaves Chris Smalling and Victor Lindelöf, who have been superb for their side over the last few weeks, but everyone is well aware of their frailties and if one of them is unsettled, pandemonium will ensue. Hence, Mourinho simply cannot allow his defense to exposed like that by throwing men forward to win the game, so we are likely to witness another cagey encounter. This will be one of the most exciting things to take note of during the game. 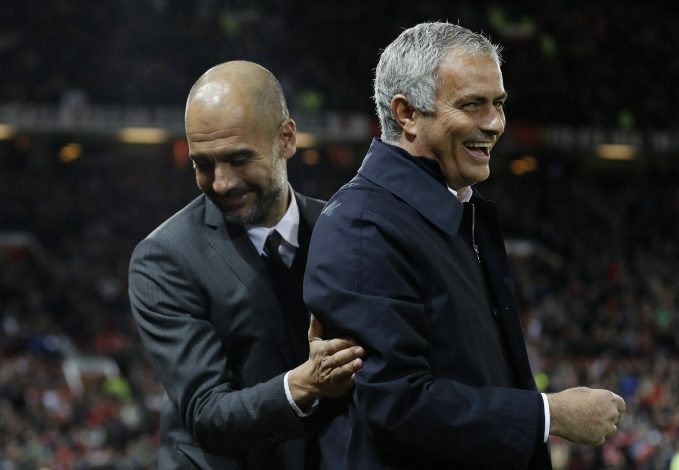 Jose Mourinho and Pep Guardiola are football’s managerial equivalent of Cristiano Ronaldo vs Lionel Messi. Two of the best managers in the world with incredible football brains, capable of thinking up ridiculous strategies to exploit their opponents’ weaknesses. The only difference is, Guardiola is not even close to being as flexible as Mourinho when it comes to tactics. If the Spaniard has a strategy, he will stick to it, even if it doesn’t work out in the end. His Portuguese counterpart though, is a mastermind in the skill of adapting to different situations. He recognizes the weaknesses in his own team first, and then attempts to find a way to play to his team’s strengths while protecting the uneasy points at the same time. Quite a tricky task to think about, but it is the type of situation that Mourinho thrives in. 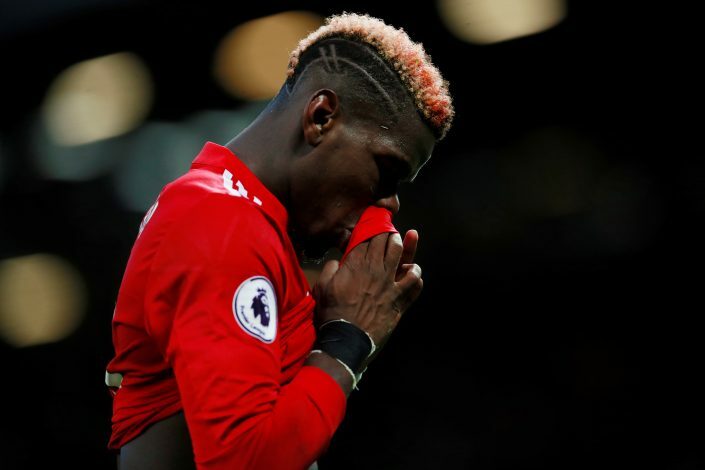 United are two different sides with and without Pogba, and Mourinho was the first to recognize this when the Frenchman missed a number of games through injury a few weeks ago. Although it seemed like the drab and boring thing to do, the United boss switched up his tactics and made his side more compact, so as to focus on avoiding conceding instead of continuing their free scoring run. Against Arsenal, his team spent more time defending than attacking, but good God were they scary to watch on the counter attack! With Pogba not in the team, we are likely to see more of that approach. He does face a dilemma though, in terms of selection. Jesse Lingard has been magnificent and would be a magnificent player to fit in if the side are meant to set up defensively and see the game out for a point or grab a lucky punt like in the Arsenal game. The other is to play Rashford and Martial together and go all out in the counter attack. Both players are not known for their ability to defend, which means starting them both would hint at a more attacking approach and an ‘in it to win it’ mentality. There are a lot of things to consider now that Pogba is out of the game, and it will be very interesting to see what Jose cooks up this time round.